I’ve had three vans since I started rubber tramping on my own. I was homeless when I got my first one. I’d made some money selling sage sticks and hemp jewelry, and several friends had helped me out with funds. As summer moved into fall and nighttime temperatures dropped in the mountains, having an indoor sleeping spot was becoming more urgent. It was soon going to be too cold to sleep outdoors, even in my snuggly sleeping bag. I saw an ad on Craigslist for a Chevy G20 (my favorite kind of van) from the late 80s. (I think it was a 1986, but my memory is fuzzy.) The owner wanted $1000 for it, but the ad said the windshield was cracked and neither the gas gauge, the speedometer, nor the heater worked. It seemed like a high price for a van that wasn’t in really great shape. Besides, if I spent $1,000 for the van, I wouldn’t be able to afford insurance, license, registration, or gas. Since it was the only van for sale in the small town, I contacted the owner. The woman selling the van seemed nice. I told her $1000 was a lot for a van in the condition her ad described and asked if she would consider selling it for $800. She said yes! I’m not great at bargaining because negotiating seems like conflict to me. But I know people trying to sell vehicles ask for more dollars than they really want so they can drop the price during negotiations. I set a time to meet the woman and test drive the van. A man I knew who claimed to be a mechanic had offered to look at any vehicles I was interested in, but when I tried to take him up on his offer, he was too busy to help. I was on my own. When I saw the van, the body looked good. The crack in the window didn’t obstruct my vision. The back seat was folded down into a bed, so I could sleep comfortably right away. The van started up, and I took if for a test drive. Apparently I still knew how to maneuver a van, even through narrow small-town streets. 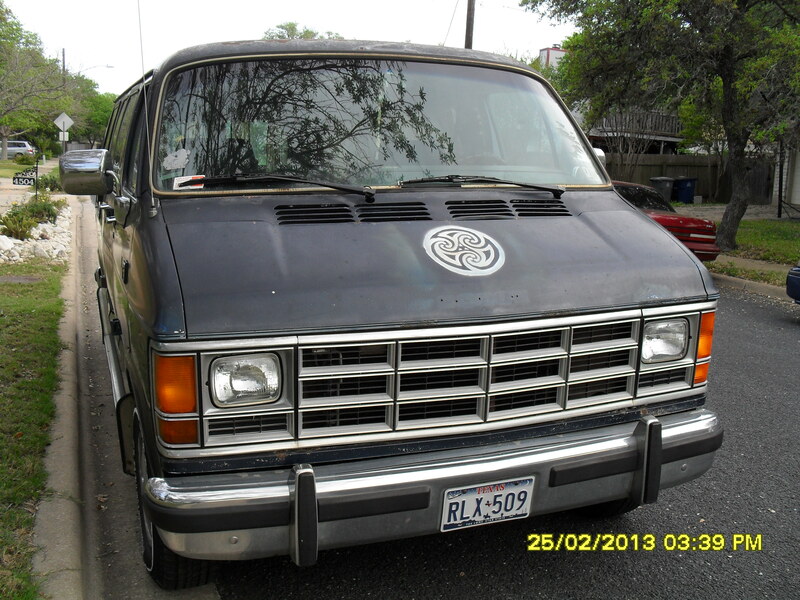 When I returned to the seller’s house, I offered her $700 cash on the spot for the van. She accepted, and I was on my way with not only a vehicle, but a new home too. 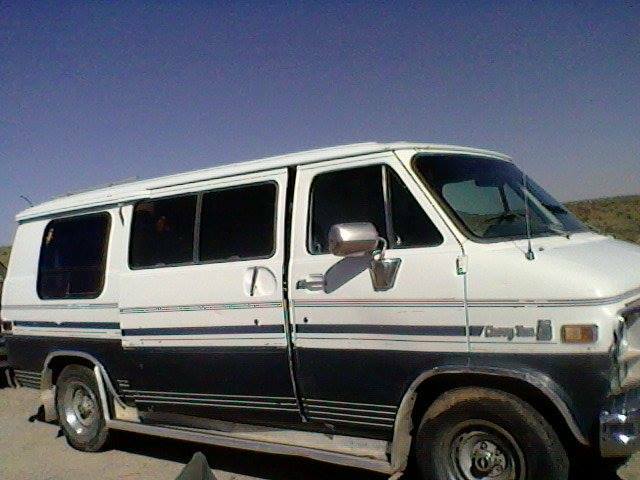 This is Betsy, the first van I got when I started rubber tramping on my own. (Thanks to the Lady of the House for helping me get this photo off my phone and into this post.) Notice the sliding side door. The door broke after a couple of months on the road and could no longer be opened or closed. My friend had a van with a sliding door that wouldn’t close and latch properly; we had to tie it shut with rope. I strongly recommend avoiding buying a van with a sliding door. That van took me and my friends literally across the country, almost from coast to coast. Unfortunately, one cold February night, I hit an elk and destroyed both the critter and my van. From where I was stranded in Colorado, it was a long, strange trip to Austin, TX, where I stayed with friends and worked to earn money for another van. (Again, good friends chipped in to help me.) I was scouring Craigslist for vans for sale before I had money to buy a vehicle. I was disheartened to see nothing available for less than $1,000, way more than I could afford. The Hippy Van of your Dreams! I was so excited. Ol’ Blue sounded great and $789 was possible. I showed the ad to Lou, and she said I better write a really good message to the van owner so s/he would like me. My name is Blaize. I have been traveling for the last 3+ years, hitch hiking, riding the ‘Hound, and rubber tramping. I had a great van I loved very much named Betsy. Betsy took me to Colorado, through New Mexico, across Arizona, into Nevada, to LA, then all the way to Mt. Shasta, CA. After that, she took me across the country to Asheville, NC, then to Austin for two months before rolling me into Colorado again. Unfortunately, Betsy and I hit an elk. The elk died and took Betsy with her. RIP, Betsy. After a month of hitch hiking and traveling with some folks who went sort of crazy a few days ago, some kind Christians bought me a bus ticket to Austin. My plan is to stay with friends, do odd jobs, buy myself another van, and get back on the road. I just saw your ad on Craigslist. Yes, Ol’ Blue does sound like the hippy van of my dreams. But I promise you, I am the hippy that Ol’ Blue has been dreaming of. If she were my van, I would drive her to the coolest places, like New Mexico and Montana, take her to every hot spring I could find. I would make sure she never got bored by being stuck in the same place for more than a few months at a time. I would fill her with kids and dogs and backpacks and food. I would make sure her oil was changed right on schedule and never let her run out of gas. The email must have worked because the owner seemed to like me. He even agreed to take a down payment, then hold Ol’ Blue until the refund check on the insurance I had prepaid on Betsy arrived. Once I bought the van, I had to park it outside my friends’ house until I could pay for insurance. This is Ol’ Blue. Notice the side door swings open instead of sliding. 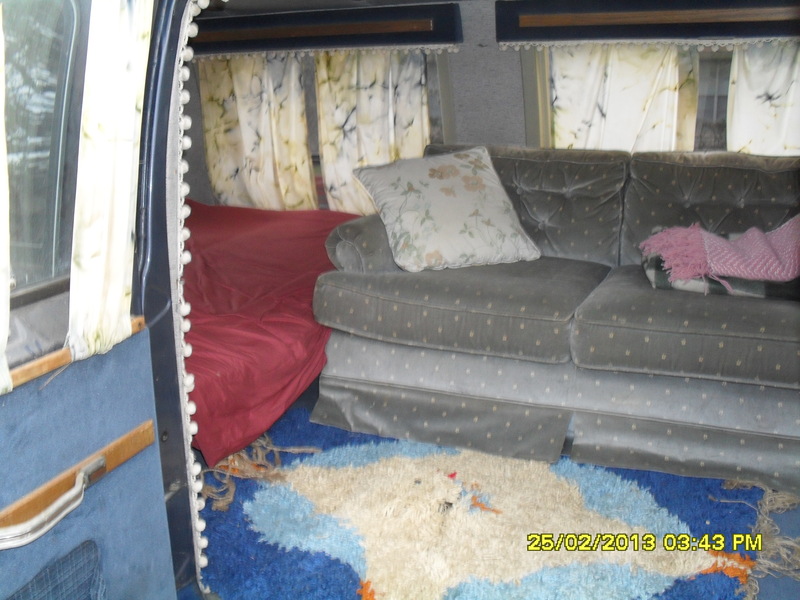 Ol’ Blue had both a full size bed and a couch. Ol’ Blue also had Celtic knots spray painted on the hood and sides and liberal stickers in various spots. Ol’ Blue had some problems other than rust damage. The main one was that it didn’t always start. An old friend who’d gone to mechanic school put in a new starter for me. A few days after the replacement, the van wouldn’t start when I tried to leave a shopping center. I called my friend who came out and hot-wired it for me. He thought the van needed a new ignition switch, but he didn’t have the time and I didn’t have the money to put in a new one, so he just put in a toggle switch as a bypass. In the next year, whenever the van wouldn’t start, I flipped a switch to get it going. Knowing that if I have a problem at night, I can climb into the driver’s seat, start the van, and leave helps me feel safe while van dwelling. When Ol’ Blue did not start, my peace of mind was shaken. Sure, I had that toggle switch, and it did get the motor going, but it was hard to get to. I couldn’t simply reach down and flip it while sitting in the driver’s seat. To get to it, I had to open my door and lean my body out while reaching down awkwardly and feeling around for the switch. Opening the door was not going to be an option if someone was hassling me enough to make me want to drive away, and I was going to look pretty dumb (and vulnerable) sitting in a van I couldn’t get started. The van had other problems too. It needed new tires, I had to add coolant fairly often, and sometimes when the indicator showed the van was in park, it was actually in reverse and rolled slowly backwards when I took my foot off the brake. I decided to start saving money and look for a new van before I found myself stranded. 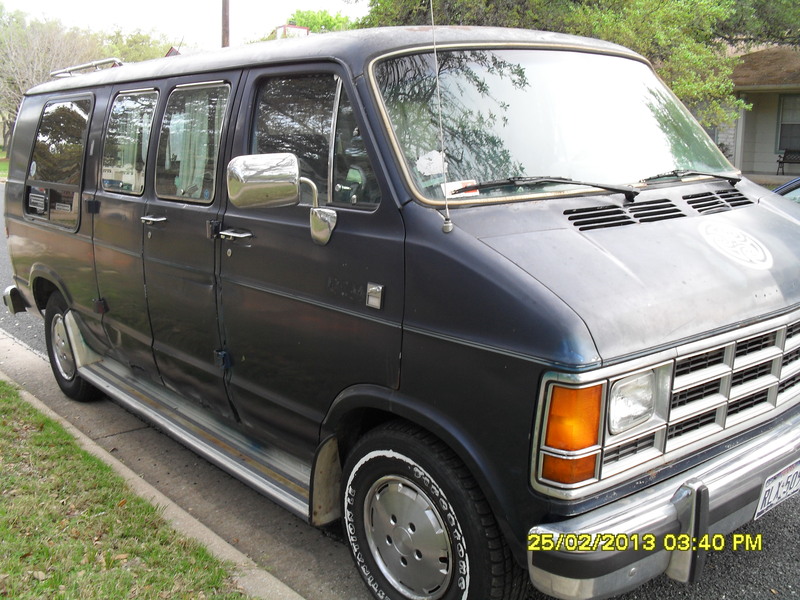 I found my current van on Craigslist too. The headline made the van sound really good, and the price was do-able. When I clicked on the ad and saw the photo, I caught my breath. This was my van! It was a G20, and it had a high top. A high top! I’m fairly short, so a van with a high top means I can stand up in it. I called the owner, a young woman who had bought the van to live in. She told me her life situation had changed and she was living in a house. She said she’d had lots of calls about the van, but no one had come by to see it yet. When I got off the phone with her, I called my friend the Rock Guy and told him about the van. I asked me if he could drive me to the city where the van was (about two hours away) in a couple of days, but he told me we needed to go that night. So we did. I bought the van for the price the woman asked; I didn’t even try to talk her down. I’ve had quite a bit of work done on the van since I bought it (new starter, four new tires, brake work, new battery, lots of front end work), but I love this van so much! (At one point I told my friends I loved the van so much I wanted to marry it!) It’s my safe space, my cocoon, my home. Thanks for sharing. Nice blog. You sound like a great person. Thank you for the sweet comment, Fran. I’m glad you are enjoying my writing.